You are here: Home / Family and Friends / Pig Pen In Your Home? Pig Pen In Your Home? 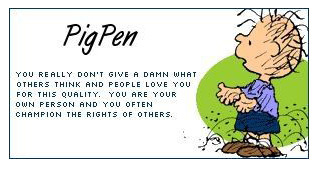 Do you have a “Pig Pen” in your home? My boys do not lack in the personal hygiene/grooming department. But, when they come home from college, they bring weeks of laundry with them. And amidst the activities of snowboarding, skydiving, going to hockey games, and friends descending on our house, they leave in their wake, clutter! Basically, bigger boys, bigger mess! They are still young, but one day, I look forward to passing on the torch to some very nice unsuspecting girls ;-). But as is the case, by that time, I am sure that they will have reformed from their “Pig Pen” habits. “You’re sure that they will have reformed from their “Pig Pen” habits? Linda!!! Wake up!! you’re dreaming. I think he just trained me to deal with it. He’s never been really messy but my girls all are! !